J&K Govt jobs in Govt Higher Secondary Schools of various districts of Jammu winter zone. J&K DSE Recruitment 2019. Lecturer jobs on Academic Arrangement (2019). 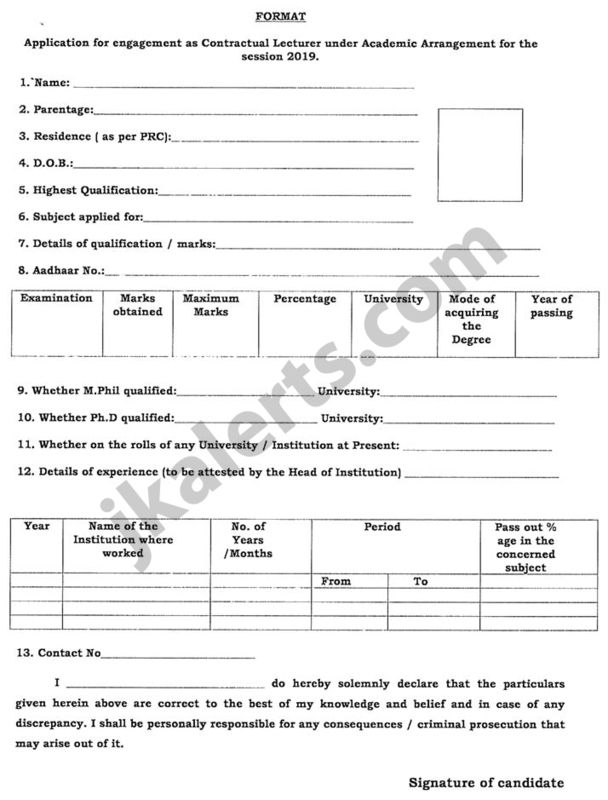 Applications on the prescribed format arc invited from the permanent residents of J&K having post graduation in the relevant subject for engagement as Contractual Lecturers purely on Academic Arrangement (2019) in Government Higher Secondary Schools of various districts of Jammu Division (Winter Zone) on District basis as per available vacancies mentioned in the annexure A. The number of subject-wise vacancies may be increase or decrease depending upon the transfer / promotions and outcome of PSC selections / appointments. 1. The engagement shall be made purely on ‘Academic Arrangement’ at +2 level on monthly consolidated remuneration of Rs. 10500/- (Ten Thousand & Five Hundred only) for plain areas and Rs. 14000/- (Fourteen Thousand only) for III/hard zones per month for the session 2019. 2. The candidates will be engaged initially for a period of three months which will be renewed subsequently strictly on need basis for another three months maximum upto the completion of the Academic Session or till these posts are filled up by appointment / posting of regular incumbent whichever is earlier. iv. M.Phil certificate, if any. v. Ph.D certificate, if any. vi. Experience certificate (s) of teaching at +2 level from Government institution (s) alongwith performance report. The complete application form alongwith all the requisite documents should be deposited in the office of concerned Chief Education Officer on prescribed format against proper receipt by or before 15-03-2019. No application shall be entertained after the expiry of last date for submission of application forms. 4. Experience = 10 points (experience of teaching in HSS, 01 point for each academic session subject to maximum of 10 points).